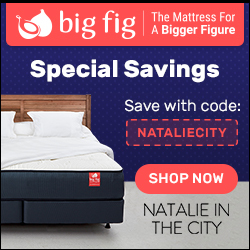 I, Natalie Craig, allow third party companies to serve advertisements and collect certain anonymous information when you visit natalieinthecity.com. These companies may use non-personally identifiable information during your visit in order to provide goods and services that may be of greater interest to you. This blog may generate ad income and accept advertising/ads and links. If you click and/or make a purchase through certain links and advertisements on this site or any of my related social media platforms, I may make a commission from that click and/or purchase. I receive gifted items from brands for review or giveaways, which are reviewed with my honest opinion. Brands and companies may also pay for sponsored posts or endorsements on natalieinthecity.com. Sponsored posts are marked within the body of the post with: "[ sponsored ]" or "[ affiliate ]." However, only the products that fit my style and are in the best interest of my readers are featured on natalieinthecity.com whether they are sponsored or not. Brands who wish to have their products featured on NatalieintheCity.com are carefully vetted to ensure my readers can relate to their brand mission. To learn more about behavioral advertising practices, visit the NAI To opt-out of this type of advertising, click here. I am not responsible for the republishing of the ontent foun on this blog on other websites or media without my permision.